If nothing else, this post will get one person I know to just crawl out of his skin. That alone is worth it to me. ...I kid....I kid. Overall, I am a fan of Alison Krauss + Union Station. Their new disk, Paper Airplane was released a week or so ago. AKUS hasn't changed much over the last 10 years. Three studio releases in this time frame, since the addition of Jerry Douglas on slide and dobro guitar - they are as close to bluegrass crossover as a bluegrass band can be. I guess I mean - they are a popular bluegrass band, which is almost kind of an oxymoron. Since the 1997 release of So Long, So Wrong, they have become a bit more formula-driven. A number of the same outside songwriters remain, the same amount of more traditional bluegrass songs (two or three) sent Dan Tyminski's way (you might know him better as the singing voice of George Clooney's character in 'O Brother, Where Art Thou') and an instrumental that features Douglas' outstanding skills on the dobro and slide guitar. I drafted the above before the disk was released, I hit all the marks except for the one instrumental. All good things, but when Lonely Runs Both Ways was released seven years ago, I almost found it too slick. It's very good, but very polished. 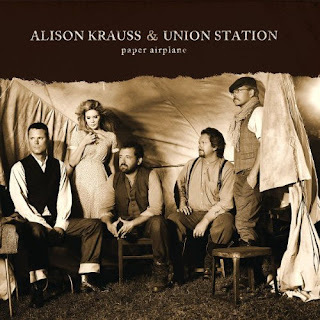 At least when Krauss (who has more Grammys for any female artist - and is only three behind for the most for any artist ever) paired herself with Robert Plant a few years back, I thought, well at least it was something different, even if it wasn't stellar. Say what you want about the band, they possess the talents on their respective instruments and their harmonies are flawless. Even non-fans, I think would appreciate seeing them live. It's nice to see nothing but their musical abilities put to work with no studio enhancement. The disk is good, if predictable. It leaves no room for errors. Like their last disk, it's a bit slick, but not quite over-produced. I keep coming back to the musicianship (Barry Bales bass and Ron Block's banjo and guitar work is always stellar). It's outstanding and their harmonies are still shining, though they don't use them to their full potential here. I really do like Tyminski's selections - especially "Bonita and Bill Butler". It took a number of listens, but I'm liking with the title track more and more. The first soaring part of Krauss' voice seems jarring, but after a bit you are used to it. Since I was in college and Richard and Linda Thompson released Shoot Out the Lights, I've been told by critics how much I should love Richard Thompson. I have yet to find his appeal. It seems AKUS' cover of "Dimming of the Day" is arguably the centerpiece/highlight of this disk. The song is nice, it is well done, it's the longest of their songs, but I don't know that it is outstanding. I'm currently not finding it that way. I'm much more into "Lie Awake". It is one of those songs that just you know you like from the first listen. It is not done justice listening to it via a laptop/iTunes either. It must be played through a proper system. Even earbuds are better. You need to hear the string bass for a song like this. It's dark, it's moody - it is right up my alley. I also like "My Love Follows You Where You Go" and the Bales written "Miles to Go". If I have a true criticism, it is that Krauss doesn't use her fiddle as she used to. It's buried on her songs, if it's used at all. The only time is put to full use is on the songs she does not sing lead. It used to be a stand-out instrument, but I suppose to play to a more mainstream audience, fiddle is a dead give-away that you're listening to bluegrass. Not so much with a mandolin or dobro guitar. It's a shame to downplay that talent. Krauss current instrument is her voice. It's clearly identifiable, like how Emmylou Harris uses hers. I totally get that AKUS is not only a band, but now a brand/commodity, so it's easy and even necessary to play it safe, but it'd be so much fun for them to open up and just let loose now and again. I guess I will have to see them in concert to see that anytime soon. While I could throw a video up for My Music Monday at a later date, I think I'll just include the clip for their title track right here. It is the title track, "Paper Airplanes". Crawl out of my skin? Uh... I think not. Boil my skin off in peanut oil perhaps and then flick off the crispy bits with a mandolin pick at you.